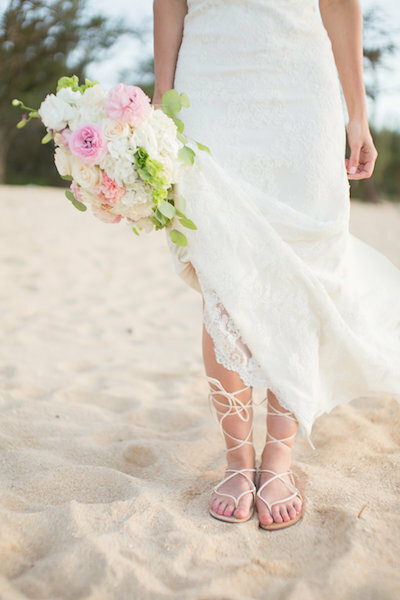 After meeting later in life, Sharron and Mark were so excited to get married with an intimate Maui Elopement on the beach! They wanted something relaxed and simple with just the two of them to celebrate their love and excitement for the future! They chose to get married in Maui because they were already planning on taking a cruise, and so it just worked out. Mark is a veteran for the Coast Gaurd and this was his first cruise, while it’s Sharron’s third! Neither of them had ever been to Hawaii before, but they have both always wanted to visit. We absolutely love that this couple is able to enjoy so many adventures together! They also both enjoy working on their older cars, and it’s obvious they love traveling with each other 🙂 . Our favorite part of their relationship is how they met! Mark was renting a house in Sharron’s neighborhood and he would wave daily as she went to work and back! How cute is that? They started talking and then Mark asked her out to dinner, and the rest is history! We’re so glad these two found one another. 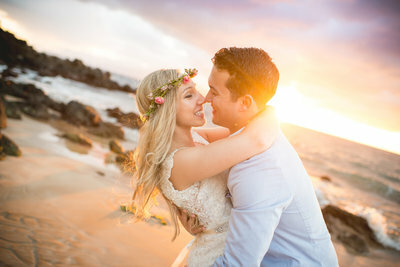 Not only are they a perfect match, but they also looked incredible together at their Maui Elopement. Sharron was a truly beautiful bride in a simple yet stunning wedding dress. Mark was a classy yet casual groom in a white linen shirt and pants, perfect for a beach ceremony! 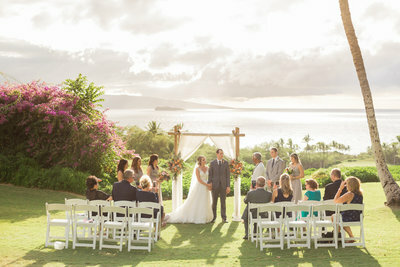 Thank you, Sharron and Mark, for trusting Simple Maui Wedding to plan the elopement of your dreams. Congratulations and Warm Aloha!